THE Government is looking at the possibility of setting up an independent body to handle the grievances of local and foreign workers which fall outside the Employment Act. With such a recourse, workers would not have to go to court to seek redress, Acting Manpower Minister Tan Chuan-Jin said in Parliament yesterday. Also, it would not just attend to low-wage workers, but certain junior professionals, managers and executives as well, he added. The non-statutory grievances it would handle include disputes over contractual arrangements such as bonus payments and disagreements over work benefits. This suggested move is part of an ongoing review to strengthen the Employment Act, Mr Tan said, when responding to questions from 12 MPs on an illegal strike last November by dozens of SMRT bus drivers from China. MPs such as Arthur Fong (West Coast GRC) and Irene Ng (Tampines GRC) had asked what lessons could be drawn from the two-day strike, which resulted in 29 Chinese drivers being repatriated and five charged in court. Mr Tan identified the need for a proper grievance-handling system as one of three broad lessons learnt. "Employers can take immediate remedial actions to address valid grievances as and when they arise," he said. He thinks it is "not practical, nor desirable" for the Government to prescribe, by law, the different good management practices that companies are expected to adopt. While the Ministry of Manpower (MOM) tries to actively promote good practices, it has to be careful not to over-regulate, he added. The second lesson is the need to better protect vulnerable workers against exploitation and educate them about their rights, even as tripartism continues to play a vital role amid the changing profile of the workforce, he said. Mr Tan said the Chinese drivers who went on strike were unhappy over three issues: their different salary and pay increments from those of Malaysian bus drivers, an SMRT circular that explicitly excluded Chinese drivers from a recent salary adjustment, and perceived lousy living conditions. Of the three grievances, the first two were contractual issues that had nothing to do with the Employment Act, he said. Both employers and employees are jointly responsible for resolving such issues amicably, and the Government needs to be wary of interfering in contractual agreements into which both sides have entered willingly, he added. Mr Tan also noted that with a large and diverse workforce, employment disputes are not uncommon. However, most are settled amicably via grievance-handling mechanisms and sometimes with mediation from MOM, he said. He also stressed that workers cannot take matters into their own hands and break the law. Several MPs including Cedric Foo (Pioneer) and Png Eng Huat (Hougang) raised the issue of foreign workers in essential services. Mr Foo asked whether MOM could be proactive rather than passive in receiving complaints, and whether Mr Tan would consider measures like audits of companies providing such services. Mr Tan replied that MOM would look at how best it can implement more proactive measures so that these organisations "are better able to stay ahead of the game". 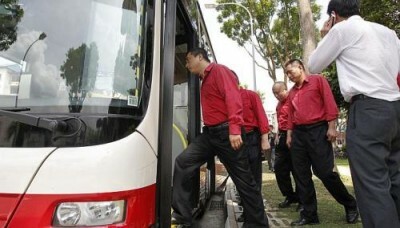 "The SMRT incident has shown that we need to be nimble and develop new ways to address these challenges early," he said.